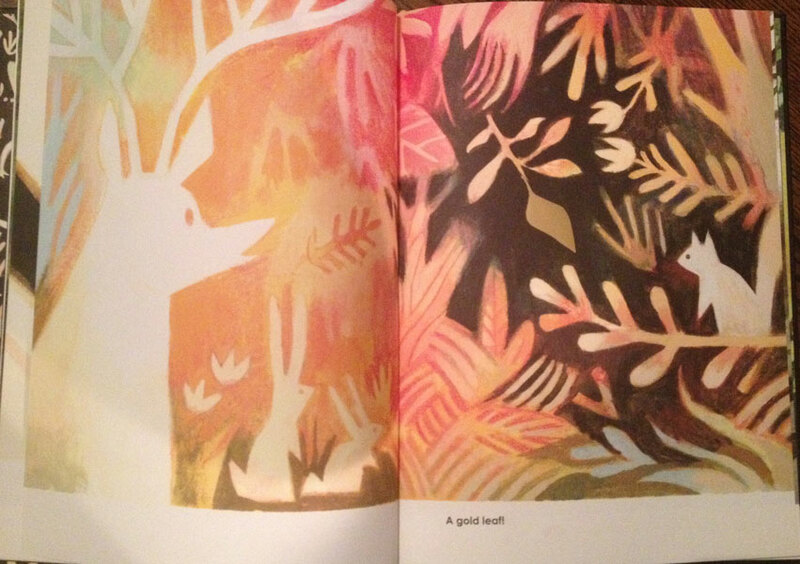 This week I’d like to share with you, The Gold Leaf, by Kirsten Hall and Matthew Forsythe. A truly beautiful book! There are a number of things I appreciate about this book, such as the use of color with the gold leafing inside this book – but that was last post! Today I’d like to talk about how I feel as though some books seem to create a real voice in our heads – one that you know you’re to use, when you read that story out loud. I find that this can happen almost automatically with many books. I’ll pick those books up and even as see the cover and read the title to my children, I’ll already know how I’m wanting to read it. I believe good books set that up for us in a few ways. Firstly, just looking at the presentation of the The Gold Leaf, it looks as if there is something gentle and magical going on here. 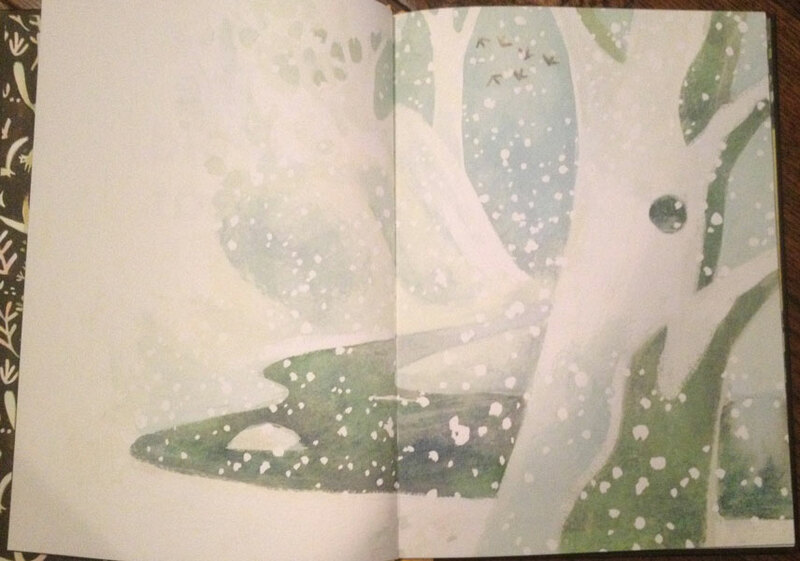 Matthew Forsythe makes a beautiful impression upon us of what this book could be about. It was a soft voice that came to mind for how I first guessed this would best be read out loud. As if we were going to witness a scene in nature and didn’t want to disturb it. It was confirmed when I open the book, and found the first page of the story, a scene of winter, without any words at all. As the story goes on, there is no rush in the text. 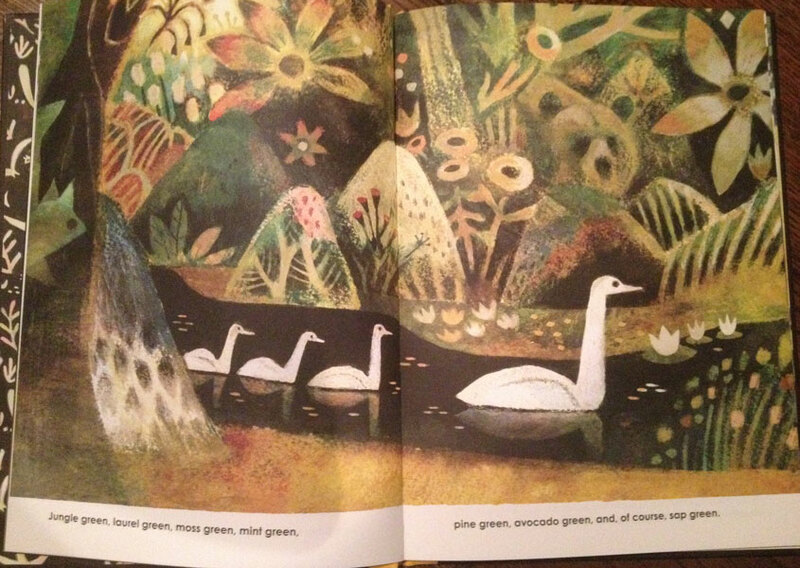 There’s such a natural flow to the words in this story, it seems to beg us to take our time reading it so we can look around for all the different greens that are described. Again, the text, like the artwork and presentation of the book, works well to maintain the feeling of the voice we’re to use. Even when the story’s pace picks up during a brief chase, it’s nothing that I felt out of place for the voice felt the book asked me to use. The character of the book was ever maintained throughout. I’m sure not everyone would find the same voice or use the same voice for The Gold Leaf. After all, we all picture things a little different even when our imagination is pointed in the same direction. But we want our stories to have a consistent voice and feeling for those who read it. I believe, Kirsten Hall and Matthew Forsythe have done an excellent job of this in The Gold Leaf. So that’s my challenge to you this week. See if you do the same thing I do – if you naturally you find a book’s read out loud voice and how you do it. And if you write, read your own story out loud and see if you find a natural voice, or if you need to cut/add some if to help your story’s voice out. That, and take a couple minutes to read The Gold Leaf! Bonus note: Mary Poppins’ Julie Andrews for some reason came to mind as someone who I would love to hear read this story. Kirsten Hall, Matthew Forsythe, The Gold Leaf. Bookmark. Thanks, Mike. Putting it on my TBR list now! Great! Let me know what you think, Katrina. I’ve met Kirsten Hall. 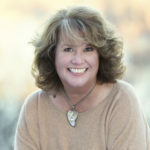 She is charming and enormously talented with many books to her credit. So happy to see this very lovely new one. Thanks for sharing, Ann. 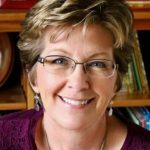 I first learned of her as an agent, but have since discovered she’s an exceptional writer as well! Wow. This sounds like a really good book for my 6 year old granddaughter. As I went in her room to kiss her good night last night, I sat on her bed and watched her eyes scan each page of the book her mama was reading to her. It was so great to see her expressions and see her soaking it all in! I bet she would love this book! We will look for it at the library. Thanks, Mike!! I hope she enjoys it as well, Sharon! My own 6 year old is the one in our family who enjoys reading this one with me. It does feel like a classic! Oh, what a beautiful book! I agree about read-aloud voices. Love it when I can fall right into a book and that happens. Wow, this book looks golden! I can’t wait to read it. 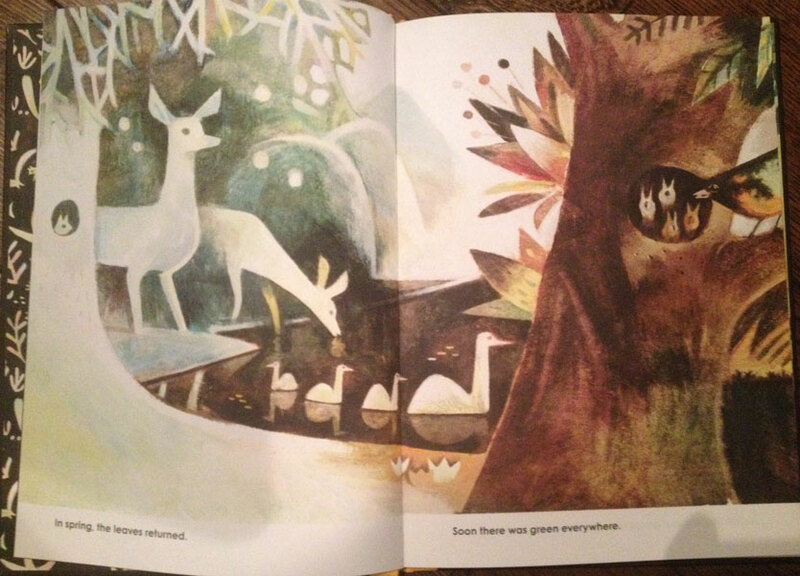 It’s enchanting and beautifully illustrated. Congrats! How true. Some books are a perfect combination of text, art, and mood. This one is beautiful. Thank you for pointing out that some books “create a real voice in our heads”. It certainly is the case with those read-alouds you return to time and time again. Thank you, Mike, for introducing me to THE GOLD LEAF. I look forward to reading this delightful book aloud to my students this school year. Additionally, I want to analyze THE GOLD LEAF as a mentor text for my WIP; a manuscript entitled OUT ON THE PRAIRIE. That sounds like a great plan, Suzy. 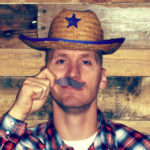 I might have to do a post on stories mentoring our own! This looks gorgeous, Mike. And it’s so true about the read-out-loud voice–some books are so distinctive that way. It IS a beautiful book, Linda. Thanks for stopping by! Beautiful! Can’t wait to read THE GOLD LEAF. I read Lemony Snicket’s 13 Words in the voice of Will Ferrell doing his Harry Caray impersonation. And I will brook no other options. Well, I concede that Mary Poppins would probably work well too. I love the gentleness of this book. 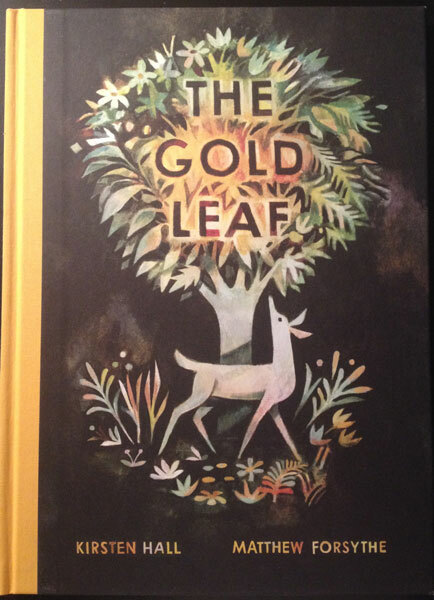 The Gold Leaf looks like a wonderful book to pair with LIFE by Cynthia Rylant, illustrated by Brendan Wenzel — a perfect match of text and illustration and not one unnecessary word. Thanks for the post, Mike. That does sound like the perfect match! I’m also looking forward to reading that one. Such a beautiful book! I can’t wait to see it. Thanks for this great post, Mike! I’ve felt the same way with other picture books. Cannot wait to read this one.